Your windscreen is designed to shield you and your passengers from the elements and – as you might expect, that leaves your windscreen itself exposed to it’s fair share of dangers. You might not realise you’re driving on a loose, perilous surface until an object flies in to your path and damages your car glass. Unless your insurance provider offers full windscreen cover, windscreen replacement can be costly and inconvenient. Awareness of potential hazards is the first step toward avoiding any windscreen damage. We’ve pulled together a list of essential tips for avoiding a cracked windscreen. Take a look below and familiarise yourself with some of the most common causes of windscreen damage. If you know the causes, it’s all the more easy to avoid the dreaded cracked windscreen. Give yourself plenty of room when you are driving behind any trucks or other large vehicles. Most windscreen damage is caused by chips being kicked up by the vehicle directly ahead of you. The large wheels that you expect to find on trucks and HGVs not only throw more debris, they also throw them further, so make sure to give them plenty of extra room. Vehicles with larger wheels are often fitted with mudflaps in order to protect fellow motorists from windscreen damage. However, sometimes not even mudflaps can leave you safe from flying debris. So, it’s always better to play it safe and allow some extra distance between yourself and the car in front. If two wheels is bad, four wheels is even worse! If you find yourself driving directly behind a vehicle with four rear wheels – try to change lane as soon as it is safe to do so. Roadworks can be the scourge of motorists and are notorious as a cause of damaged windscreens. Pneumatic drilling in particular is renowned for kicking up the kind of stone chips and debris that are often the cause of cracked windscreens. When planning your journey, do your best to take roadworks in to account and avoid them wherever possible. This one might seem a little obvious but it’s better to be safe than sorry. The closer you drive to the car ahead of you, the more likely you are to expose your windscreen to damage from flying road chips and debris. Here’s one way to look at it; the more room you leave between yourself and the car in front, the more time you are giving rocks to fall back to the ground without impacting your windscreen. If you want to avoid a costly stone chip repair, try and leave at least two car lengths between yourself and the vehicle ahead of you. As mentioned already, impact from flying stones and debris while driving, is one of the most common causes of windscreen damage. But, you might not realise that the extent of the damage is usually determined by the speed at which your car is travelling, as opposed to the speed at which the loose debris is flying through the air. So, as important as it is to leave plenty of room between yourself and the vehicle ahead, it’s also wise to reduce your speed. A few less km/h stand to drastically reduce the likelihood of your car requiring windscreen crack repair. Potholes are another one of the most common causes of windscreen damage. They increase in size, become more hazardous with each vehicle that drives through them and litter the road with loose stones and debris. Try to be extra vigilant of potholes if your car already has a small crack or chip in its glass, as hitting a pothole can send vibrations throughout your car that will exacerbate the issue. 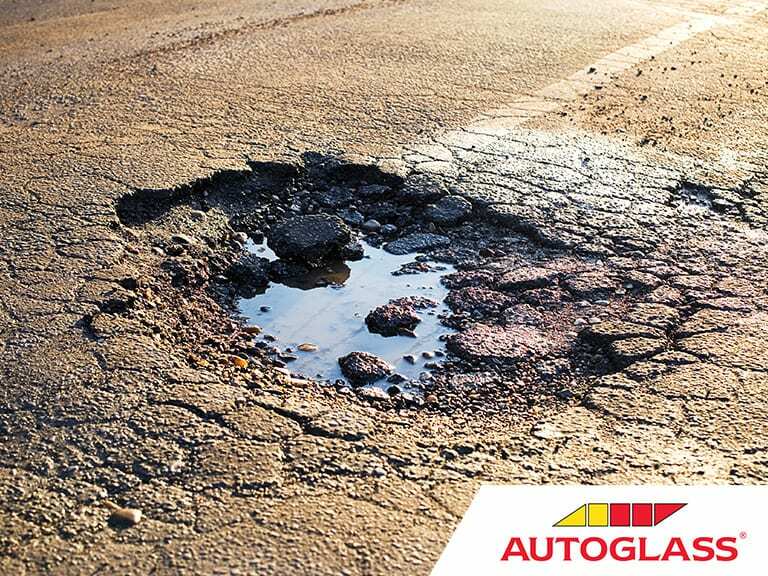 Windscreen damage aside; potholes can also cause considerable damage to your tyres, knock your steering out of alignment and unbalance your wheels. For the benefit of your car on the whole, do your best to avoid poorly maintained road surfaces. There you have it, the Autoglass guide to avoiding a cracked or chipped windscreen. With a combination of planning and diligence, you should be able to sidestep any inconvenient windscreen repairs or costly replacements. We hope you found this guide illuminating and don’t forget to check the Autoglass blog regularly for more hints, tips and explainers. Thanks for reading and drive safe.